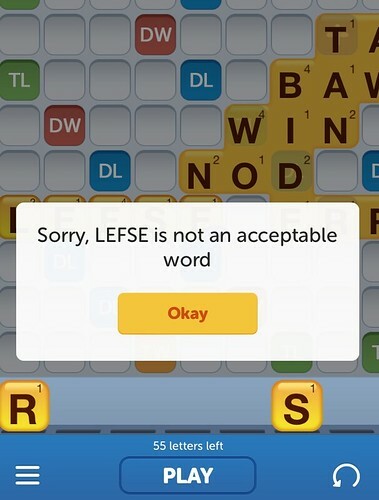 I have a real problem with Lefse not being in Words with Friends. Someone on line noted tamale was ok. But not lefse. As a Minnesotan who found the word incredibly obvious in his tile lineup and a real treat because it was a potential triple word score, I was shocked to get the Sorry message. And then I read the Wikipedia entry which says it's only in some states' grocery stores, Starbuck (MN) is home to the largest lefse, and Rushford (MN) produces the most in the US. Maybe it is primarily a Minnesota thing, although I don't know what the hell else I'd call it if someone gave me some. Does everyone else in the US just pretend it's a defective flour tortilla?